Ride to Fun! This state-of-the-art bus system connects accommodations and tourism attractions throughout the city of Niagara Falls and Niagara Parks. 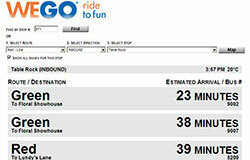 Ride WEGO two full days for one low price! Ask your accommodation host about WEGO options, including the Niagara Falls Adventure Pass or the Niagara Falls Wonder Pass. All bus lines meet at Table Rock, the main transfer hub to the Green line that runs through Niagara Parks. Use your mobile device to locate your bus and get estimated arrival times. WEGO takes you to popular attractions in Niagara Parks and throughout the tourism areas of Lundy's Lane, Victoria Avenue, Clifton Hill, Fallsview, Main & Ferry and Queen Street. Items left on the bus? Call us at 905-356-1179 to provide information about your item and we will do our best to find it. WEGO welcomes your feedback. Please e-mail wegoinfo@niagarafalls.ca.